While the spam issue is increasingly difficult to control, especially with the rise of botnets, legitimate marketers are still experiencing a percentage of false positives. Best practice and authentication have seen widespread adoption, but many email marketers are nevertheless faced with some blockage issues. ISPs insist that sending relevant content for higher list engagement will increase the reputation score and improve deliverability rates. While this fact is undeniably true, ISPs are becoming overwhelmed with maintaining their in-house blacklist and it is inevitable that human error can occur. Thus, the tendency is to seek help by outsourcing to a certification company. 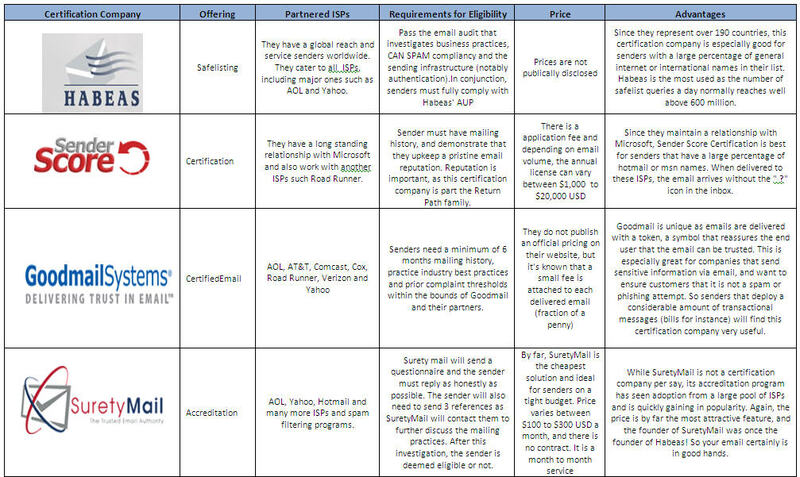 An email certification firm will closely work with the anti-spam department of a given ISP and provide a list of sending IP addresses that should not undergo the standard filtering process. The IPs in question have been given the go-head, as they have been marked as “good” mail. However, senders pay a fee to be certified and it still does not guarantee full inbox delivery. If a campaign yields a high number of negative email metrics (namely hard bounces and spam complaints), it can promptly trigger termination or suspension of the service. Certified senders are pristine in terms of best practice and data collection and normally should not run into these problems, but regardless certification is not a silver bullet to the issues the industry is experiencing. How does a sender become certified? Certification companies maintain very high standards, and only accept the “cream de la cream” of senders. But as a sender, which certification company should they aim for?